The <keygen> tag are specifies a key-pair field generator used for the forms. The element generates, public key is sent the server side and locally stored the private key after the form submit. The <keygen> tag supports the Global Attributes and Event Attribute. The <keygen> tag belongs to flow content, phrasing content, interactive content, listed, labelable, submittable, resettable form-associated element, palpable content. 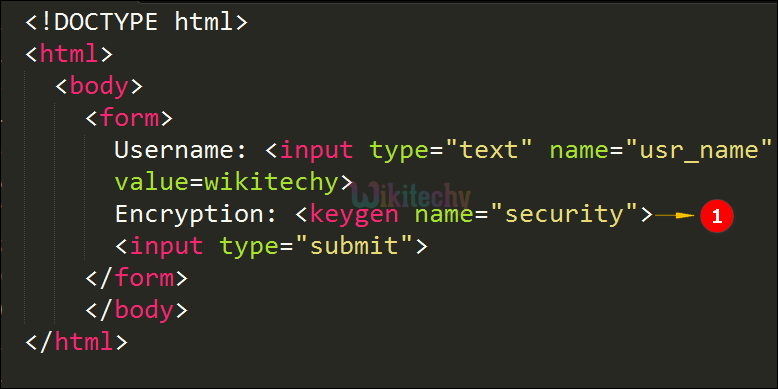 The <keygen> tag is new in HTML 5 version. The <keygen> tag is used to process the web forms for the security encryption system. The <keygen> tag is used to generate the security encryption system for form submission. autofocus autofocus No Yes It specifies that <keygen> element should automatically get focus when the page loads. challenge challenge Yes Yes It specifies that the value of the <keygen> element should be challenged when submitted. ec Yes Yes It specifies the key for the security algorithm. name name Yes Yes It Specifies the name of an <keygen> element. disabled disabled Yes Yes It Specifies that a <keygen> element should be disabled.